Descriptions of the technical visits are provided below the following table. The fees cover logistic costs such as transportation. Visits have a limited capacity. Some visits have security restrictions. Registrations are done using the IFAC2107 registration web service. Departure from Congress Center at 13:30 on Monday 10 and Tuesday 11. Transportation to LAAS-CNRS by private bus. LAAS-CNRS is the Laboratory for Analysis and Architecture of Systems, one of the largest CNRS research centers. LAAS-CNRS works on various types of systems: micro and nano systems, embedded systems, embedded systems, distributed large-scale systems, biological systems, mobile systems, autonomous systems and critical infrastructures, with application areas such as aeronautics, space, transport, energy, services, health, environment, telecommunications, manufacturing and defense. The Automatic Control oriented teams of LAAS-CNRS are highly involved in IFAC2017 World Congress organization. The robots supporting robotics research at LAAS-CNRS are gathered into a platform. A tour of these experimental test beds is proposed, which includes: humanoid robots, dual-arm mobile manipulators, fast outdoor robots, flying robots, etc. The related research spans motion planning and control, advanced perception, multi-robot systems, human-robot cognitive and physical interaction, etc, Live experiments will be demonstrated. 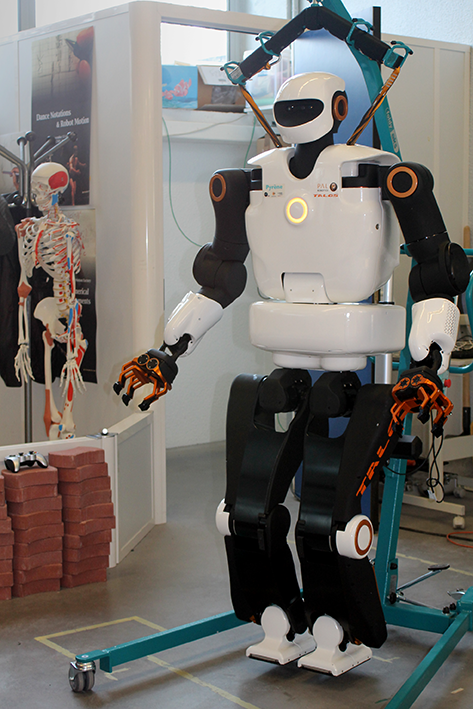 We will demonstrate the results of the European project FP7 Koroibot on the HRP-2 humanoid platform. HRP-2 will demonstrate multi-contact stair climbing, real-time foot-step generation using model predictive control, and walking on a beam. After stating the technical locks faced during the development of the demonstrator, the new humanoid robot Pyrene, specified by LAAS-CNRS and built by PAL-Robotics, will also be presented. Pyrene is the first prototype of the TALOS series aiming at industrial application. The robot is taller, stronger and has torque sensors. Next, an Aerial Robotics Testbed static show will take place. We will introduce videos demonstrating recent results on flying robots within the AeRoArms EU H2020 project and the Tele-MAGMaS team finalist at the Kuka INnovation Award 2017. Furthermore, we will statically show the main aerial robotic prototypes internally developed at LAAS, constituting the “LAAS Aerial Robotics Testbed”: the Tilt-Hex, a tilted propeller hexarotor able of fully-actuated aerial physical interaction by contact inspection and cooperation with grounded arms; the FAST-Hex, a convertible hexarotor able to transit from an efficient configuration to a fully-actuated one; the Protocentric aerial manipulator (PAM), a quadrotor equipped with an ultra lightweight arm for aerial manipulation. Last, videos will demonstrate visual based functions for multiple people detection, identification and tracking, and visual based feedback strategies for coordinated object assembly by a dual-arm manipulator. The tour will end by a live demo of audio-motor source localization from a mobile binaural robot. How chips are made ? This exceptional visit will allow you to discover the various steps and equipment for integrated circuits (chips) manufacturing of which are present in multiple devices of everyday life (cars, computers, games consoles, mobile phones, etc.). After wearing a protective clothing, you'll visit the various resources of the clean room, a strictly controlled environment (dust, temperature, humidity, light) in order to avoid contamination; because at a chip scale, a tiny grain of dust represents a rock that blocks the paths dedicated to the circulation of electrons that transmit the signal and therefore the information. Making electronic chips consists in depositing, patterning and characterize multiple layers of numerous materials with a resolution going from a few nanometers up to a few centimeters. This prototyping is "collective" in order to decrease each chip cost. These chips are mainly produced on silicon wafers, but also on III-V materials, organic materials, diamond... More about the Micro and Nanotechnologies Platform. Departure from Congress Center at 14:00 on Monday 10. Transportation to Airbus by private bus. Visitors will be able to view the Airbus (commercial aircraft) ground test facilities, including the A350/A380 “Iron Birds”, flight simulators and telemetry room. Two staff members from Airbus design office and flight tests will guide the visit and present some aspects related to automatic control. Remark: Registration deadline 1 July, for security check purposes. Due to stringent security reasons, please note that Airbus retains the right to refuse the access to the industrial site after having conducted the necessary checks. Non EU resident participants will have to provide: family name, first name, nationality, company name, date and place of birth, Passport number, Passport expiry date. Departure from Congress Center at 10:00 on Tuesday 11. Transportation to Quai des Savoirs by Metro (do not forget your ticket). Quai des Savoirs: Interactive exhibition room, science café, workshops, creativity rooms, test areas of digital devices... This "new generation" science center aims to promote and strengthen scientific and technical culture for the greatest number, with the theme "Building the Future". The Quai des Savoirs constitutes a hybrid space at the crossroads of research, innovation, entrepreneurship and creative culture. The technical visit at Quai des Savoirs will give the opportunity to discover the current exhibition and interact with the creators of the installation. Abstract: This original and immersive exhibition invites the public to discover urban landscapes through an immersion into the heart of worldwide cities. The exhibition deals with people and their commitment in their cities as ordinary heroes. What is meant by "city"? How does it evolve? What are the differences and the common points around the world? What are the professions that "manufacture" the city? What are tomorrow’s innovations? Smart-cities? What tools are provided citizens to influence their city? "Inventez la ville... dont vous êtes les héros" proposes to discover all this through an immersion in the heart of cities of the world and their multiple facets. The exhibition sweeps past, present and future of the city, offering the visitor a real interactive journey. As soon as you enter exhibition, you are entrusted with a mission: become a hero the time of a journey in order to explore the city. Then starts the adventure, moving from astonishing curiosities in a futuristic laboratory, an architectural firm or even a cosmopolitan coffee. In each space, you will have to collect information, use all your senses and gradually build your city. Departure from Congress Center at 9:30 on Tuesday 11. Transportation to Cité de l'Espace by private bus. Young or old, curious visitors or passionate enthusiasts, the Cité de l’Espace offers you a gateway to the infinite and the extraordinary. Discover real space craft, journey to the edges of the cosmos and uncover all the secrets of space. With its 2,500m² of exhibitions, its 5 hectares of gardens, its IMAX 3D giant screen cinema, its Planetarium and simulators, setting off to explore space and the wonders of the Universe has never been easier! 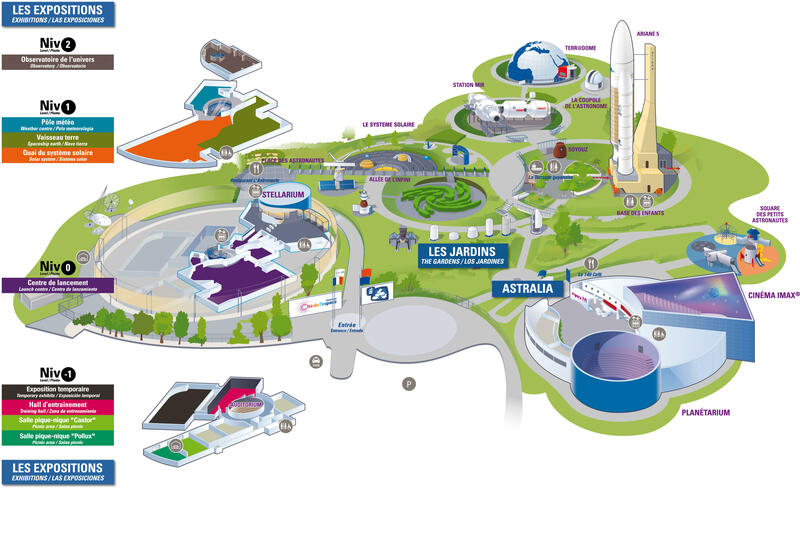 The technical visit at Cité de l'Espace will address both the myths and dreams that are associated with "space": stars, spaceships, astronauts, space exploration ... and the essential reality of spatial domain and astronomy, presented in the Cité by miniature and real size reproductions. Technical discussion about space, science, and how to present it to the public will take place with specialists of the space domain and our hosts. The visit includes an IMAX movie "Beautiful Planet". Departure from Congress Center at 9:30 on Wednesday 12. Transportation to Airbus Defence & Space by private bus. Visitors will be able to view the Airbus Defence and Space telecommunication spacecraft integration room (actually entering the room is not possible for cleanliness reason). A staff member from Airbus Defence and Space Aocs/Gnc & FDS technical unit will present Airbus Defence and Space products, Space Systems products and which control engineering technologies are applied at Airbus Defence and Space. Remark: Registration deadline 20 June, for safety check purposes. Non EU resident participants will have to provide: Name, Nationality, Company, Birth date, Birth place, Passport number, Passport expiry date. Sold out: registration is no more possible for this visit. Departure from Congress Center at 13:30 on Wednesday 12. Transportation to Manoir du Prince by private bus. The World Congress features a special session dedicated to Automotive Advanced Control Demonstrators held on Thursday 13 July. An additional session of these demonstrators is organized in the form of a Technical Visit on Wednesday 12. For attendees eager to participate actively to the demonstrations (being in the cars as passengers), it is recommended to register to the Technical Visit of Wednesday 12. A small fee is asked to cover the expenses of transportation by bus to Le Manoir du Prince venue. See here the details of the 13 automotive demonstrators. Departure from Congress Center at 14:00 on Thursday 13. Transportation to Ginestou-Garonne plant by private bus. Do you know what happens to the water you use? Find out by visiting the Ginestous-Garonne plant, thanks to its complete de-pollution system, treats 125,000 cu.m of waste water from the Toulouse area every day. Visit of the wastewater treatment plant “Ginestous Garonne” in Toulouse, a real technological showcase. - Virtual visit of the wastewater treatment plant “Ginestous”: collecting, treating water, treating odors, valorizing sludge. - Visit of the technical installations: de-oiling, de-sanding, decanting, treatment of nitrogen and rejection in the Garonne river.